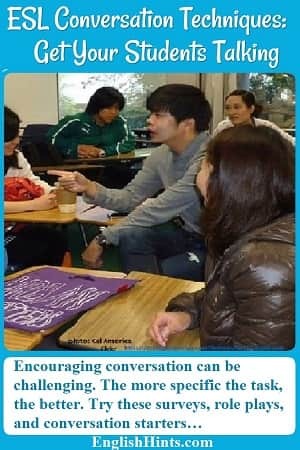 ESL conversation techniques and activities are helpful because talking about something in a different language is more complex and challenging than filling out a worksheet or reading a text and answering questions. You can’t just ask your students to “talk to your partner about___”. The clearer and more specific a task you can give them, the better the results. All of these can be made easier for beginners by providing the form of the question and the basic structure of the answer, or more challenging for intermediates by making them think up Qs and As. The more advanced your students, the greater variety of tasks they can handle. Beginning students, for example, can do very simple role plays of everyday activities after practicing a simple dialog on the same subject. Advanced students don’t need the dialog, and can take on more complicated situations (see below for some ideas.) Advanced students can also discuss their opinions and preferences much more freely, problem solve, etc. For extensive lists of ESL conversation topics with suggested questions (mostly Intermediate up) visit iteslj.org or try ESL Discussions. See also a set of excellent ESL conversation (and other) lesson plans at TEFL.net with suggested questions aimed at pre-Intermediate students. · Corners: Decide on four discussion topics (or points of view on a topic) related to your current lesson or teaching point. Label or designate one corner of the room for students who choose that topic to congregate. This lets each student choose the topic or angle on a subject that interests them most. Students in each corner discuss their topics, then (for an intermediate or advanced class) may choose a representative to present their insights or conclusions to the class. · Line up (partner exchange) for short Q & As: Each student in one line has a question. The student opposite him/her in a second line answers that question (either his personal answer or according to an assigned role), then rotates one student to the left and answers the next student’s question. This is similar but shorter (and less open-ended) than a Mingle, below. Home> ESL Lesson Plans for Teachers> ESL Conversation Techniques.